Every year the bold and the beautiful flock to Orlando, Florida to celebrate Mardi Gras. This Spring, visitors get to shake a tail feather as Universal Studios Orlando transforms into an explosion of colorful parades, concerts and ‘N’awlins’ style food and spirits. Taking place from February 9thto April 4th, all festivities are included with theme park admission and annual passes. Witness outrageous street performers and chow down on authentic Cajun food, while listening to live New Orleans bands. Using the same float company as the original Mardi Gras, the parades take place every night, rain or shine, throughout the festival. They begin at the Hollywood Area in Universal Studios. 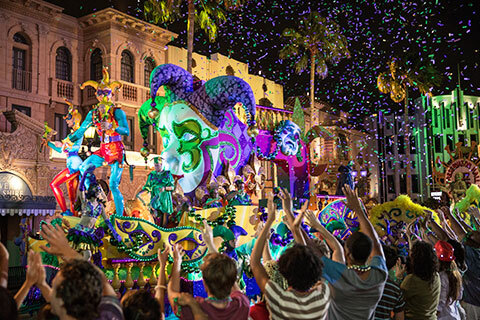 Mardi Gras at Universal Orlando™ is designed to be family friendly, and includes a special parade viewing area just for children. The parades are around twenty minutes in length. The concerts take place on the Music Plaza stage in Universal Studios, beside Despicable Me Minion Mayhem®. On selected nights you can catch some amazing R&B, Pop, Rock and Country acts, including Bush, playing on Feb 9th , Macklemore on Feb 23rdand Sean Paul on March 10th. Concerts are mostly standing room only and there is no separate VIP area. Get there super early if you want to be near the front! This year’s French Quarter Courtyard sees Universal Orlando mimic ‘The Big Easy’, with sweet soul music from the South and Cajun and Creole bites, not forgetting Jambalaya, a favorite dish of the Bayou. We have some fantastic vacation rentals close to Universal Studios, from 5 bedroom The Toasted Marshmallow , which rents from USD$240 per night, to 11 bedroom The Showstopper , which rents from USD$630 per night. Less than thirty minutes away by car, it’s a fabulous family vacation home for Mardi Gras. If you’re thinking of head to Orlando to celebrate, just get in touch and let us know your party size and we’ll magic up the rest! Booking directly with us means that you’ll pay NO service fees too!